Ergonomic pedal design and adjustable straps provide efficient and comfortable pedaling. Velocity Exercise’s CHB-U2101 Upright Exercise Bike provides users an effective and challenging workout in the comfort of their own home. Indoor cycling offers the same cardio benefits of outdoor cycling, but allows the user to do so safely at anytime from the comfort of their home or office. 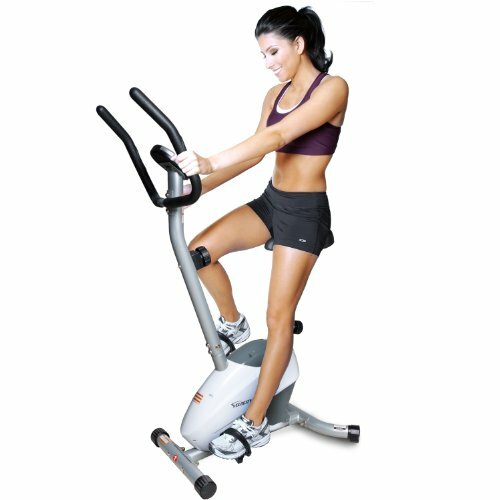 Compact and sporty the CHB-U2101 provides many of the features and functions that can be found on higher priced Upright Bikes. The CHB-U2101 offers features such as manually adjustable resistance, 4 kg flywheel and comfortable seat surface and padded handles with integrated heart rate monitors. Additional highlights include a magnetic control system which can be used to adjust resistance based on user experience or as an additional challenge to their workout. The pedaling system is a maintenance free 3 piece axle/ crank system with adjustable pedal straps. The seating area is adjustable to accommodate a variety of user heights. Other signatures of the Velocity CHB-U2101 include; a large easy to read digital LCD display monitor. The monitor’s functions include Time, Speed, RPM, Distance, Calories, Watt and Heart Rate. The oversized resistance knob allows the user to choose from 8 various levels of resistance. The CHB-U101 also comes with built casters so the bike can be easily transported and stored. Velocity Exercise has 30 years of fitness and exercise experience behind it so you can buy with confidence. All of our equipment is independently tested and passes strict ASTM standard for safety and durability. Velocity offers a broad range of exercise products for all fitness levels. Please visit our Amazon store to view many other products and accessories.